Cleaners union occupies ISAP (metro) HQs and secures series of concessions. On Wen. 25/2/09, during the 24h strike of ADEDY, the umbrella trade union for the public sector, across Greece which saw all schools, universities and civil services shut down, 90 autonomous trade unions headed by PEKOP the autonomous union of cleaners whose gen. secretary K. Kouneva was attacked last December with acid by thugs of the OIKOMET corporation, occupied the HQs of ISAP, the public metro company that was subcontracting Kouneva from OIKOMET. The ISAP HQs had been occupied again last January by protesters in solidarity to Kouneva and the cleaners. This time the autonomous syndicalists demanded that ISAP ends its contract with OIKOMET for violating labour and social security legislation, and instead hire cleaners directly as permanent staff. ISAP and its general trade union conceded to all the demands pledging to immediately end its contract with OIKOMET, and start a process of passing the necessary acts so as to hire permanent direct staff of cleaners. In the meanwhile ISAP also pledged that any dealings with private corporations in the subcontracting of cleaners will be first approved in terms of social security and labour rights standards by PEKOP. PEKOP declared that it will continue its struggle against "all forms of modern slavery till the final victory". 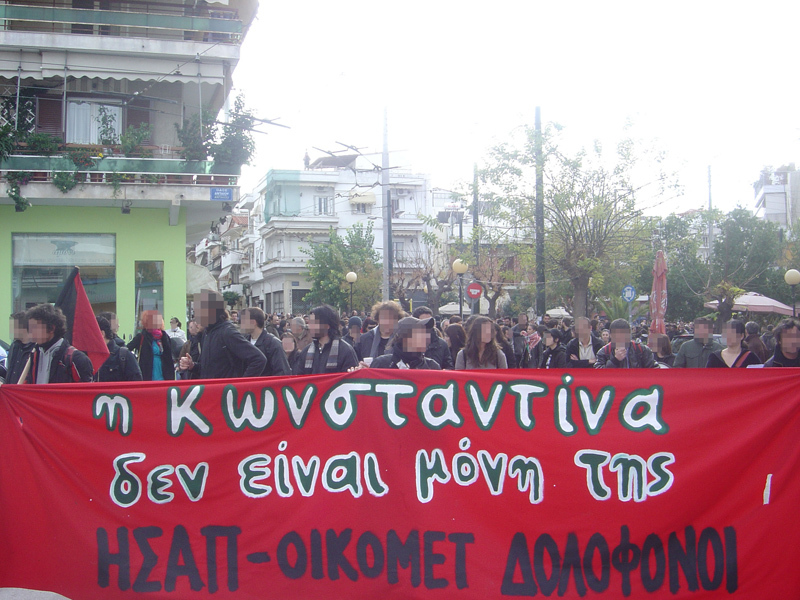 The landslide concessions come after a long campaign in solidarity to K. Kouneva and the cleaners, which during the last week saw the occupation of Thessaloniki's municipal radio station and ISAP's metro station in Petralona, the Athens neighborhood of Kouneva. When asked to comment on the often violent form of solidarity action to their cause, PEKOP refused to condemn it. Kouneva herself is recovering but still in the hospital and has dismissed overtures by both PASOK (Socialdemocrats) and the Coalition of Radical Left (SYRIZA) that wanted to see her as candidate MEP.